There’s less than one month left until my 38th birthday. I just loved the Random Act of Kindness project I staged for my birthday last year so I decided to put forth a similar challenge this year. As a reminder, last year I did 14 random acts of happiness during the first 14 days of December and I asked all my Facebook friends to consider doing just one nice thing for a stranger. Then on the 15th, my birthday, I asked everyone to post a message on my Facebook wall telling me what random act of kindness they committed. 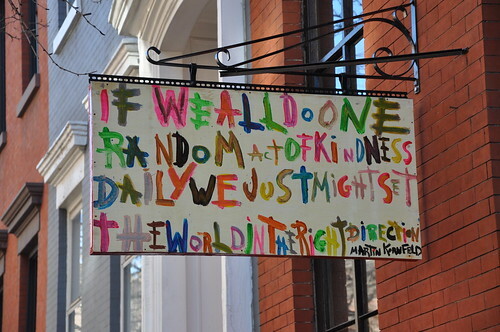 I was hoping that between my 14 and whatever my friends did I would achieve 37 random acts of kindness. In the end, more than 50 acts of kindness were committed for my birthday. I was pretty excited about the whole thing and it was a great way to get into the holiday spirit. I wanted to do something like that again, but thought it would be fun to come up with a new idea to get people to help their communities or the world. Enter, the Donate Your Age project. This year, for my birthday I’m asking my friends to donate whatever age they are right now to a charity of their choice. On my birthday, please post on my wall or on the Sweet Little Nest Facebook page telling me what organization received your donation and why it’s important to you. NOTE – I realize that giving of your money might be more of challenge than, say, sending a Christmas card to a soldier or taping a bag of quarters to a soda machine. Feel free to be creative in your donation amount. For example, you could add up your digits. Let’s say you are 38. Just make a $2 donation if that’s what you can manage. I don’t need anyone to tell me how much they donated, but I do want to know who got your contribution and why it matters. Start thinking about how you want to make your donation, but please don’t tell me until my birthday. My birthday is a Saturday this year. After I place wreaths at Arlington National Cemetery (something I did for the first time during my Random Acts project last year), I’m looking forward to curling up on the couch and learning more about your favorite charities. American Cancer Society’s Relay for Life (Team Jeremy) - my friend Lynda lost her husband to cancer this fall and she’s walking for both of them in the 2013 event. Lost Dog and Cat Animal Rescue Foundation – our boy Casey was cared for by these amazing volunteers and they helped us save Casey’s life when we found out he had parvo four days after bringing him home. Rockaway Disaster Relief Fund – this fund was set up through my office to help the communities on the Rockaway Peninsula rebuild after the devastating Super Storm Sandy in October (the area has a special connection to the candy industry). Habitat for Humanity - hurrah for sweat equity! Gilchrist Hospice Care (Formerly Hospice of Baltimore) – these angels took care of both of my grandparents in their final hours. Freedom to Marry - because, as Don and I said on the occasion of our own wedding, if the two of us are allowed to marry, everyone should be. Thanks so much for considering participating in my Donate Your Age birthday project. I’m hoping that I can raise at least $600 for various charities this year. What do you think? Can we do it? The arrival of December means that 1. It’s almost Christmas (! ), 2. It’s almost my birthday (!) and 3. The year is coming to a close. I don’t want to diminish the year as a whole. Some amazing things happened for my friends and family this year. Some got married. Some had babies (or are still growing them). Some found great new jobs. Some bought their first homes. Some got out from under unpleasantness in its various forms. But, if I’m honest, it was a tough year for me for lots of small reasons. We hired an architect who didn’t work out and we lost some money on the deal. There was our remodeling project which went on and on. My dad had a big health scare (he’s fine now!). I got strep throat and shingles and a flare up of my chronic eye condition. We had rain and rain and more rain and our roof leaked a lot. My heart is heavy for my friend Jeremy who has a destructive cancer and is fighting for every day he gets to spend with his wife and young son. Other people I love have lost or are losing people they love to progressive illnesses. However, at least once a week Don or I look at the other person and says, “We’re so lucky.” Even in a year when it’s been easy to point out all the bad stuff, the good stuff is still there. That feeling has intensified for me even more now that we’ve gotten through our home study. So, it’s in that spirit that my birthday project was born. Well, first I was inspired by this woman who committed 38 random acts of kindness for her 38th birthday. Using her birthday project as a template, I developed my own birthday project. For the first two weeks of December, I am going to do at least one unexpected, unrequested kindness for someone else every day. I recruited my Facebook friends to help and asked that in the same period they each do just one nice thing for someone else. Then instead of sending me well wishes or birthday cards they can share with me their story of committing a random act of kindness for someone on December 15, my birthday. If you’d also like to help and we’re not friends on Facebook, simply leave a message in the comments below telling me all about your random act of kindness. It will make my birthday the happiest day. Really it will. UPDATE 12/2: The Facebook note with the daily updates is public so you should be able to see it even if we’re not (yet) friends. UPDATE 12/4: I have photographic proof of some of my projects.